Google just released Chrome, its open source browser which has a bundle of new features like making tabs different processes. In some ways, it seems to be a throwback to the days of IE6 where tabs would actually be processes! However, the new paradigm gives a tabbed UI and a process based backend, which should be interesting to try. 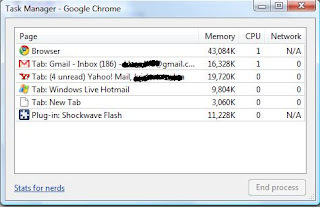 One big advantage with Chrome is going to be finding out which processes are badly designed and hog memory — something that is pointed out in this blog post. 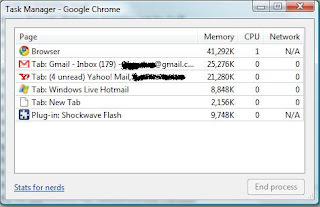 It seems to me that that all the mail programs actually use up a lot of space (and Gmail/Y!mail top it at around 20Mb each — looks like there was some GC happening and Gmail process collected back some memory). Live mail seems to be the most lightweight! However, what I am worried about — if my mail tabs are using up that much space and it is only going to go up as these applications add more complexity, why would I not use a desktop based mail client, and switch to a web based client while on the go? A lot of times I have to face flaky connections, and it seems obvious that web based mail clients are downloading a ton of stuff everytime! The pain point of offline mail clients is the ability to keep perfectly in sync with the server (IMAP notwithstanding and perhaps that should be worked upon) and the ability to install updates, due to which their UI is now lagging behind web based counterparts. If desktop applications can figure out some way of cleanly installing new features and keeping things completely upto date, would they get back in vogue?